When life gives us lemons…we say thank you very much! 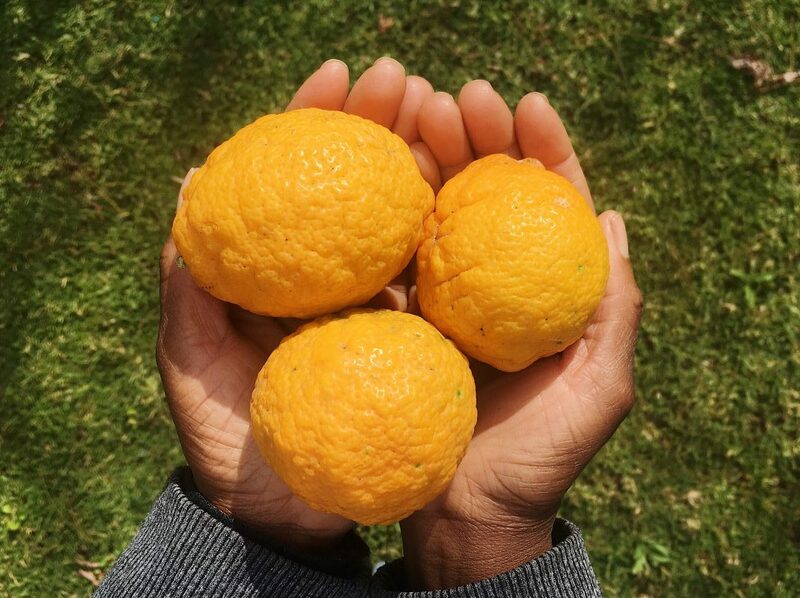 We absolutely love lemons, and oranges and naartjies and limes and grapefruit! Citrus fruit is such a wonderful winter highlight, and so we thought we’d share some interesting facts about citrus fruit! There are so many different types of citrus fruit out there, from bright red blood oranges, to small sour kumquats. Most of our modern citrus fruits are hybrids, meaning they were created by crossing a few original species. For example, modern day lemons & limes originally stem from a fruit called a citron, which is thought to have originated in India. It is typically a large fruit, although its size and shape varies, and it has a very thick rind and many seeds. A little different to the lemons and limes you’ll find in the shops nowadays! Most citrus trees are evergreen, meaning beautiful green foliage all year round, and most of them are also self-pollinating. Interestingly though, research has found that bee pollination may increase the size of the fruit, the likelihood of producing fruit, but also the frequency of seeds in the fruit. Organically farmed citrus fruit is definitely a better choice for our environment, but it may be a healthier choice too! We all know that citrus fruit is a great source of Vitamin C. But did you know that organically grown citrus fruits may have more of this immune boosting Vitamin! One study, conducted in different orchards in the south of Portugal, found that citrus fruits from organic farming had higher concentrations of Vitamin C, compared with fruits from conventional (chemical) farming, but this result differed by type of citrus fruit. And, did you know, you can’t judge an orange by, well, how orange it is? The colour of an orange is not an indication of how ripe it is, but rather an indication of climatic conditions. The skin of citrus fruit changes colour when it starts to get colder, as the chlorophyll in the skin starts to degrade. In some regions that don’t experience cold winters, citrus fruits remain green until maturity. The only way to know whether your orange is ready to eat, is to taste it! And, once citrus fruit has been picked, it doesn’t continue to ripen, or get any sweeter. If oranges are picked when they’re green, they’re often artificially treated to make the skin orange, so us picky consumers will still buy it! We love learning about the beautiful produce in our boxes each week, as it makes us appreciate the food we’re eating, and understand a little more about where our food comes from. We hope you’ll share these interesting facts with your family and your kids, and if you have an interesting citrus fact to share, comment below!